Over 4 billion video views happen to Facebook everyday. And users would like to tell rich stories with Facebook video, not only in the timeline, but also in business ads, and covers. By uploading video to Facebook directly, you can take advantages of the benefits that your video will play automatically in News Feed and have view counts that helps people discover them. However, uploading video to Facebook is not an easy job if your video is undesirable for Facebook video uploading requirements. As the fact that people prefer to record their own videos with iPhone, GoPro, camcorders, you do need compress video for Facebook before uploading. And this post makes it clear on Facebook video upload specs and how to compress video smaller for Facebook without quality loss. Resolution should be 1080p or under. To optimize the quality of your video, you're suggested to upload HD video indeed. By the way, since October 2017, Facebook is testing 4K video playback for video game streamers and creative people. Although up to 4GB file size is supported, there may be longer upload times associated with larger files on poor Internet connections. Videos must be less than 240 minutes long, but various for different types of video. The longer your video is, the larger its file size will be. It would affect the quality of the video and the time it takes to upload. Q1: What's the best video setting for Facebook shared post video? Landscape and Portrait videos are recommended to compressed to 1280 x 720 dimension, minimum width at 600 pixels, 16:9 or 9:16 aspect ratio, MP4 or MOV format, 4GB file size, 120 minutes and 30fps frames max. By the way, mobile renders both video types to vertical 2:3 aspect ratio for optimal display. So if you're used to watching video with mobiles, you're suggested to shrink video to 2:3 aspect ratio, 720p. Q2: What are the 360 video settings for Facebook? Facebook 360 Video is better set in 4096 x 2048 dimension maximum, 600 pixels minimum, 2:1 aspect ratio, MP4 format, 1.75GB file size at most, no longer than 40 minutes and 60fps max. Q3: How about uploading ads videos on Facebook? What's the suggested setting? - For Desktop News Feed Link Video: 1280 x 720 dimension for Landscape and Square video, minimum dimensions 600 x 315 (1.9:1 landscape) or 600 x 600 (square), 16:9 or 1:1 aspect ratio, MP4 or MOV format, 30fps frames at most, no more than 120 minutes and 4GB. - For Carousel Video Ads: 1080 x 1080 dimension, max file size is 2.3GB, video length max is 30 seconds or less. Others go same as Desktop News Feed video. - For Collection Video Ads: 1200 x 628 dimension, and others are the same as Desktop News Feed video requirements. - For Facebook Cover Videos: Cover video should be in 20-90 seconds, at least 820 x 312 pixels, and the recommended size is 820 x 462 pixels. Now that you have a clear understanding of the Facebook video uploading requirements, then you should know how significant it is to compress video for Facebook. No matter you'd like to shrink iPhone video or reduce GoPro video size for uploading, MacX Video Converter Pro owns the ability to commit to Facebook video compression. It's a superb Facebook video compressor which features to convert and transcode video to H.264 MP4, MOV, reduce MP4 video file size, change video resolution, frame rate, aspect ratio as you need, trim the length of video, crop video dimensions and so on. Besides, the video processing will be achieved at blazing fast speed, up to five times faster than Handbrake without losing quality, all thanks to the multi-core utility, Hyper-threading tech, High-Quality engine and the unique Intel/Nvidia/AMD hardware acceleration technology. [Tutorial] How to Compress Videos for Facebook without Losing Quality? Step 1: Load your video to the program. At the very beginning, you need to free download the Facebook video resizer and launch it. Then click on the + Video button or simply drag-n-drop your target video to load it to the program. You can import several videos at once for video processing in batch. 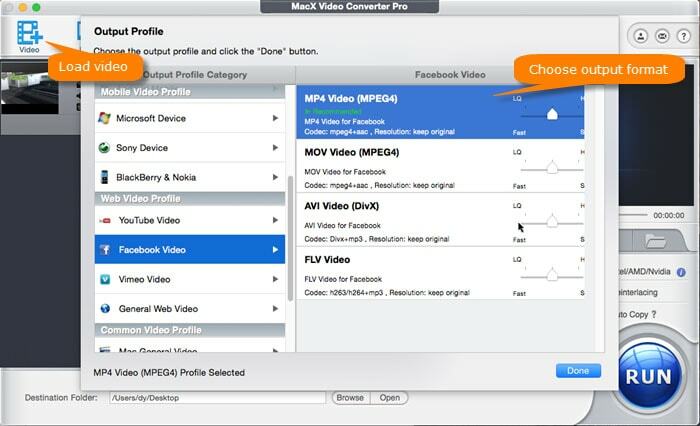 Scroll down to Web Video Profile and tap Facebook Video to choose MP4 Video (MPEG4) as output profiles. You're able to choose other Facebook recognized formats like MOV, FLV, MKV, 3GP etc. as well. Step 3: Adjust parameters to meet Facebook upload demand. Click on the icon to enter a window to change video resolution, aspect ratio, frame rate, bitrate, audio. According to the type of video you want to publish on Facebook, choose the best fitting parameters indeed. For example, to upload a shared post video on timeline, select 1280 x 720 resolution, 16:9 aspect ratio, under 30fps frame rate. Optionally, if you video is longer than 120 minutes, click on button, and tap Trim, then Enable trimming to set the Start/End Time for split your video into pieces. And if you'd like upload a Carousel Video Ads to Facebook, tap Crop & Expand and tick on the box of Enable Crop to choose 1:1 aspect raio from Crop presets. Or you can also adjust the position of crop box on video picture to customize to any aspect ratios, including vertical 2:3 for mobile shared posts. Step 4: Start compressing video for Facebook. Tick on the boxes of Use High Quality Engine and Deinterlacing. Then tap the RUN button in the lower right corner to start up the video processing for Facebook. It will take you a few minutes to accomplish the task, but it all depends on the length of your video. To cut down a normal 5 minutes or so iPhone video, less than 1 minute is needed but in almost original quality. 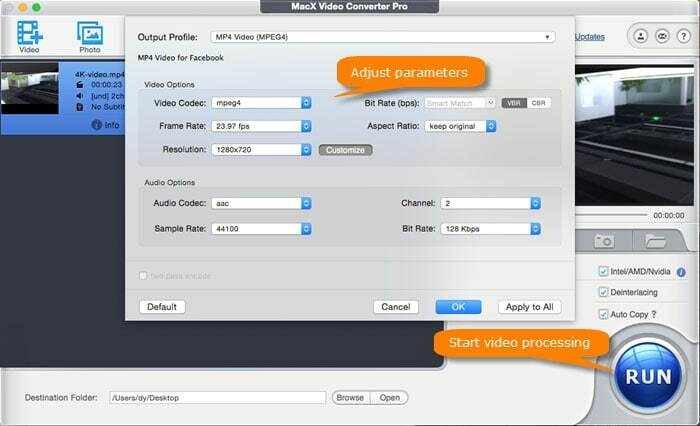 MacX Video Converter Pro can process video to meet Facebook video uploading demands, viz. transcoding and converting video to MP4, MOV, changing resolution, downscaling frame rate to 30 fps or lower, trimming video length and crop the dimension of videos for Facebook. Change Frame Rate among 23.97fps, 29.97fps, 30fps etc. How to Compress Video Files? Top 4 Solutions Here! Best video size resizer on Macbook Pro/Air, iMac etc.